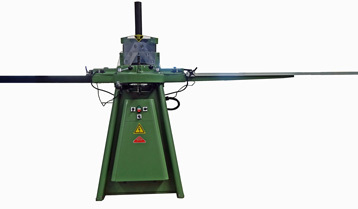 Morso E Future Green is a fully automatic, electric mitring machine with a two-hand release built on. This makes the machine absolutely safe to operate as it is impossible to start the machine and touch the knives at the same time. With Morso-E Future Green you achieve the clean smooth cut by automatically cutting of the work piece in two cuts, as long as both push buttons are activated at the same time. The cutting time varies from 1 second and up, depending on the thickness of the work piece. Having finished the cutting, the knife block automatically returns to the starting position. The starting position (horizontal movement) is adjustable up to 60 mm, (Max. width of work piece is 100 mm.) and from 60 mm the Morso-E Future Green will automatically cut the work piece bit by bit. The variable start position is adjusted by a handle placed on the machine. The vertical movement of the knife block is also adjustable with three different heights. Position 3 for very thick work pieces, up to 180 mm. cuts an exact and perfect 45-degree mitre. Morso-E Future Green is available three phase with voltage to your requirements.